The holidays are fast approaching and a great many people are already making plans to visit their cherished family members. During this special time, millions of families will see just how much change a year can make in their family- how children have grown, or how relatives have aged. With holiday reunions come an opportune time to check the well being of our older relatives. As people age, their needs and abilities change. They may have trouble getting around the house or difficulty driving. They may not remember things as easily as they once did, and adult children of aging parents may notice that Mom or Dad is having difficulty with daily living activities. During your holiday reunion, you may notice an unusual behavior or that details of a family tradition are suddenly absent, perhaps the same story is being repeated over and over again. These can be your clues. 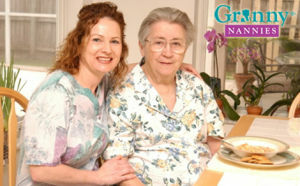 We all want to support our older loved ones’ desire to live independently, and this is the mission of Granny NANNIES – referring professional care providers to help maintain and support an ongoing quality of life. As you reunite with your older loved ones this holiday season, be aware of their needs and abilities and take heart in knowing that should assistance be required – be it a few hours per day or around the clock- services are available to provide them with the utmost care in the comfort of their home or location of your choosing. ← Making the most of your “ME time” off.